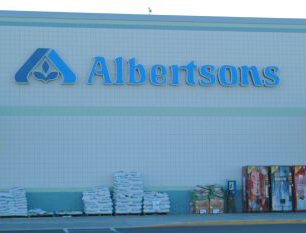 This Albertsons store used 8" Grey Splitface and Smooth Single grid CMU to provide a cost effective, low maintenance building. 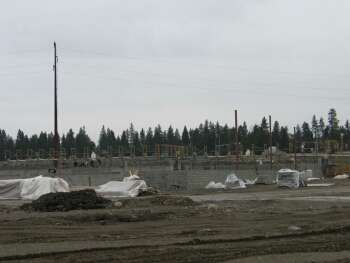 The masons are fighting the rainy weather at this project in Coeur d'Alene, ID. 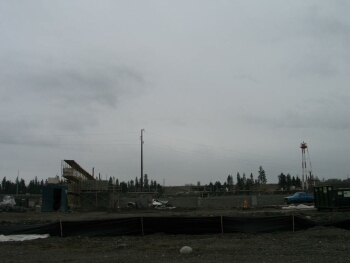 Weather related setbacks can be a common issue this time of year in the Inland Northwest. 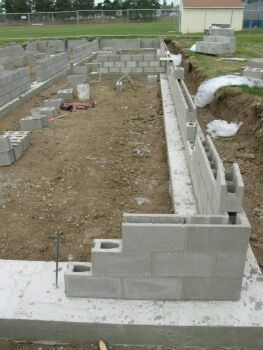 All the footings are poured and the block are waiting to be laid in the wall. 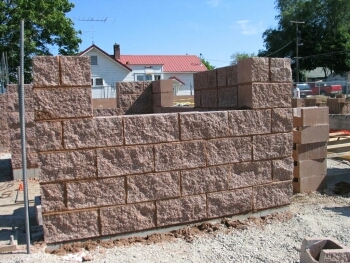 While masonry is best suited for dry warm days, Dempsey Masonry will get the job done. 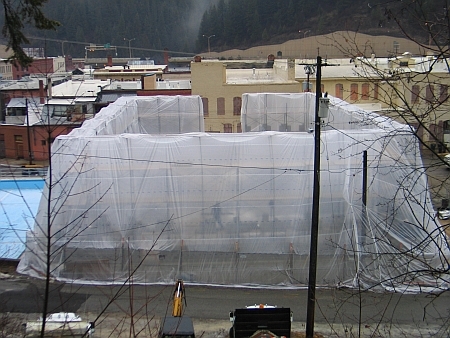 In our region, it is not unusual to have to tent the work space to keep it dry and warm. 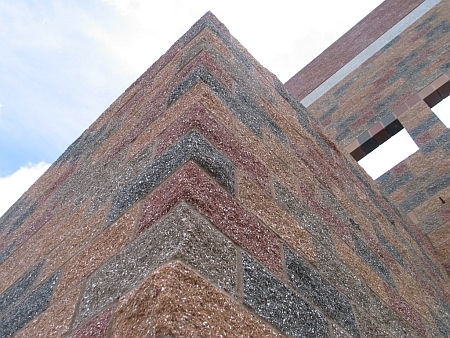 The building will use 2 colors of splitface CMU. Padre Brown and Desert Tan have been chosen to create a complimentary color scheme. 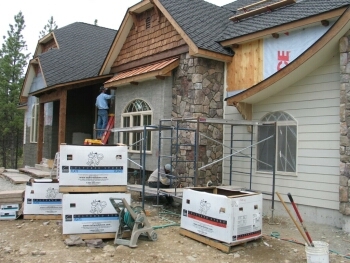 Foshag Masonry is on the second phase of this development. 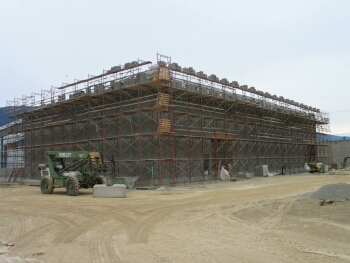 The first phase consisted of 6 seperate buildings and the second phase has a total of 9 buildings. They are using our 4" Splitface CMU - Padre Brown color. 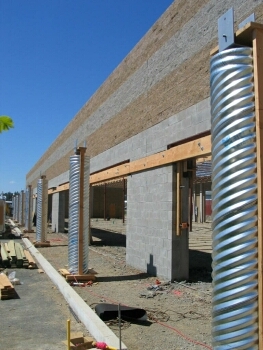 This project utilizes an 8" Splitface 1 side and 2 ends for the columns at the front of the building. This size block creates a nice 16" square splitface post once installed. 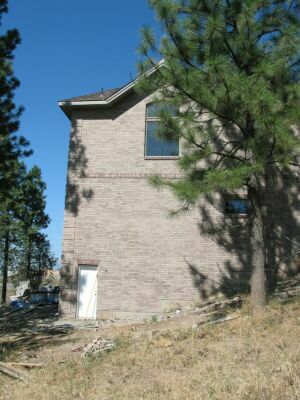 This project uses the Denver Brick Company's 2-1/4" Tuscany Standard as the main body of the building. 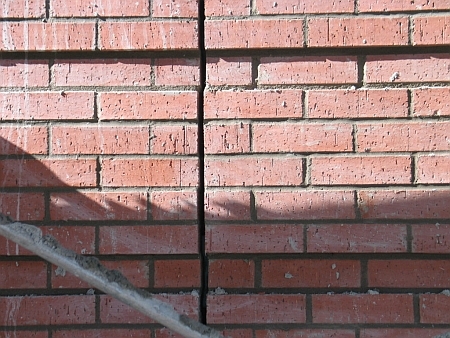 The accent brick is a 2-1/4" Desert Tan Grain. 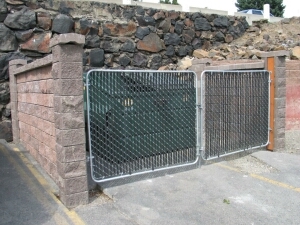 The versatility of the Allan Block Fence System allowed the Ccontractor to build this Trash Enclosure. 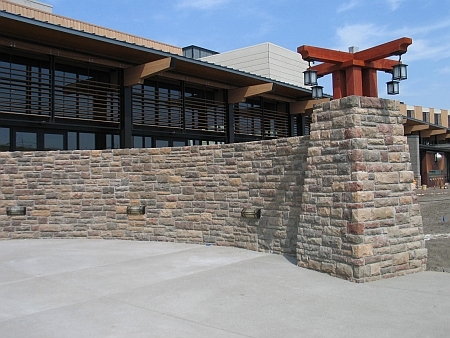 The Redrock Blend color matches the retaining walls and the AB Courtyard used on this project. 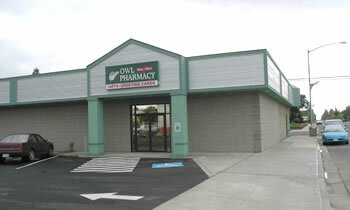 The architect was looking for a unique and durable masonry product to create a fence around the dental office. 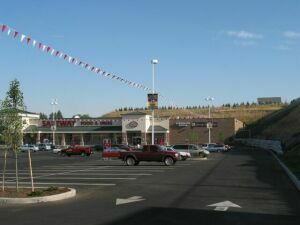 In the end they chose the Allan Block Fence System for its aesthetics, construction cost and its long term durability. 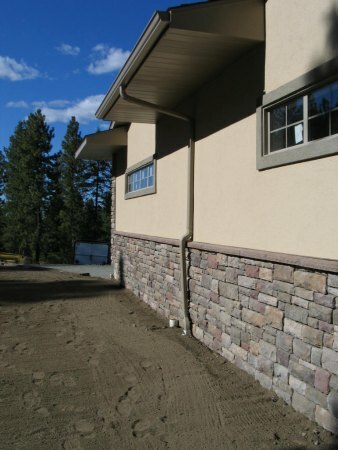 They specified Desert Tan and Khaki colors which work well with the veneer stone and the stucco colors used on the building. 4x8x16 Splitface & Smooth 1 Grid Standard Block. This project used all Natural Gray color CMU. 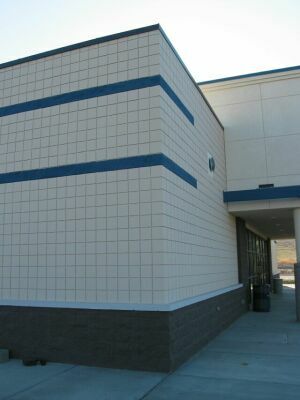 The building was painted white with an accent band of blue. The Single Grid CMU adds an attractive design to the building. 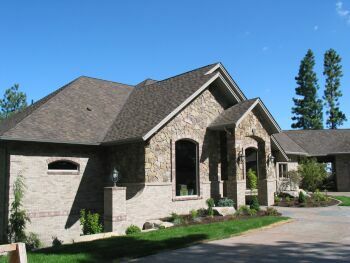 This residence uses Acme Brick - Denver Plant's 2-1/4" Modular brick in the Limestone color. 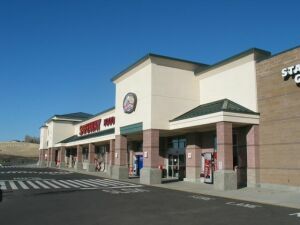 The accent Brick is Acme's Plumb Creek color. 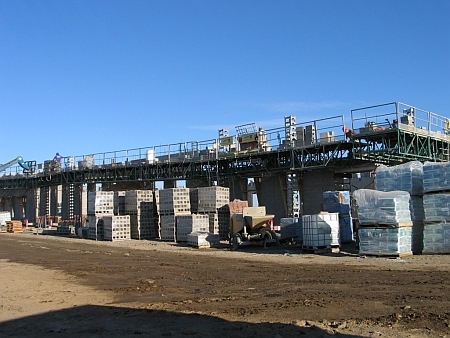 Rob and his crew laid over 22,000 brick to complete this project. They also used Cultured Stone's - Dressed Fieldstone - Bucks County at the main entry of the house to compliment the brick work. 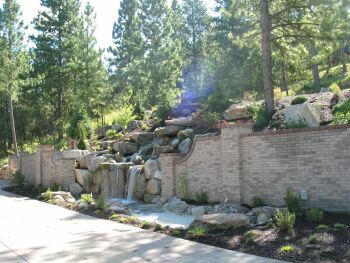 The use of brick to create the backbone for the waterfall and pond area is a great compliment to the house as well. 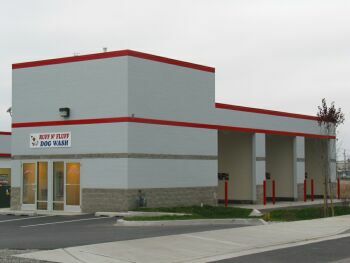 The design called for a secured parking area for the new tenant at the Broadview Dairy Building. The architect used a combination of the Allan Block Fence System and the Brick Columns with Wrought Iron to achieve an aesteically pleasing, secure area. Our Redrock Blend color was used for all the AB Fence Posts, panels and caps. 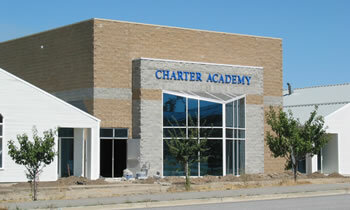 The Charter Academy used our Desert Tan Splitface CMU along with our Natural Gray Splitface and Smooth CMU. The result is a very crisp, clean contrast for this great looking building. 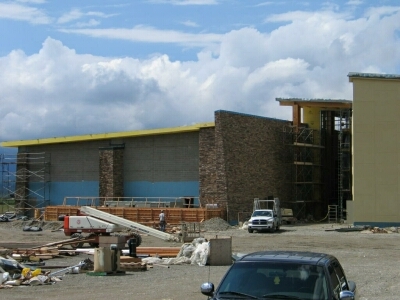 The expansion and remodel at the casino has been very benficial to many of our local contractors. Joe Olds and his crew at Curb King have been laying up this Limestone Chardonnay veneer. 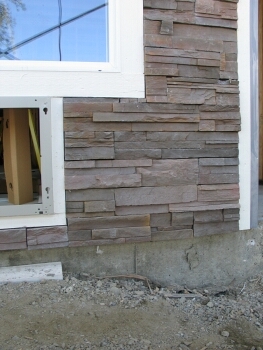 The entrance & courtyard have been enhanced by the linear look of the chisled stone veneer. The growing congregation was running out of room for worship, so they decided to expand. 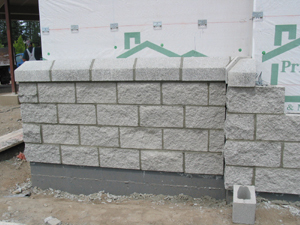 The concrete masonry was chosen for its durability and constructability. 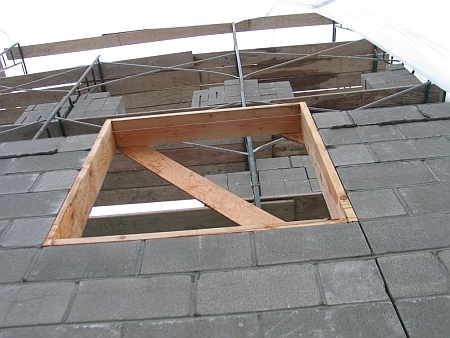 There are a multitude of block widths based on what was required for structural construction. 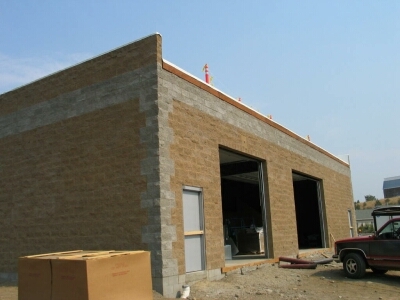 12"x8"x16", 8"x8"x16", 6"x8"x16" and 4"x8"x16" Smooth and Splitface blocks, in both natural gray and in our Desert Tan integral color were all used in various areas of the building. 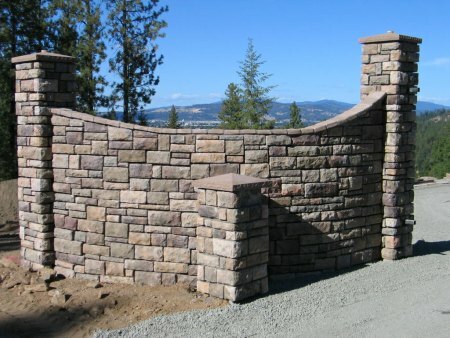 This was an early spring 2011 project for Matt at M&S Masonry. 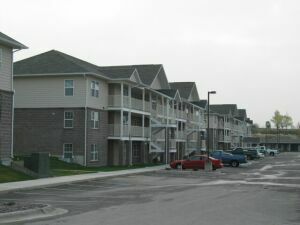 The City of College Place required a high strength block for the building. 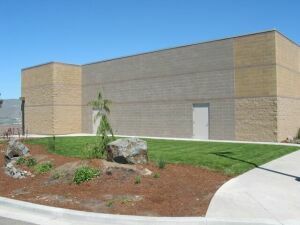 An 8 foot tall fence design was needed for security around the new Echostar Satellite Facility. 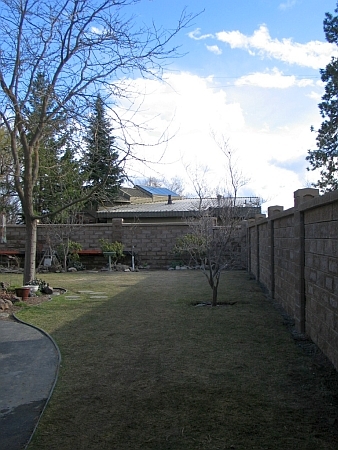 Along the property line with residential housing, chain link fence was not an option. 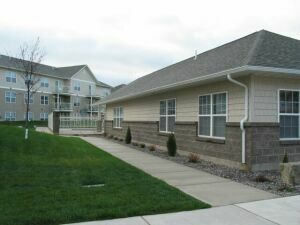 They needed a solid fence construction that would provide minimal maintenance and long term durability. 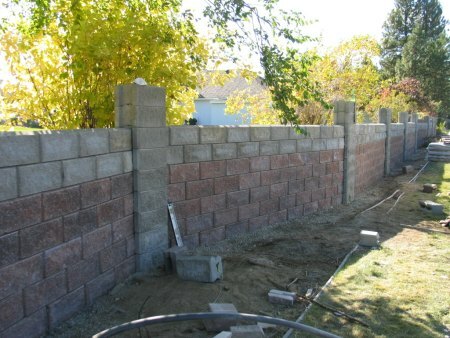 Allan Block's Fence System filled the bill! 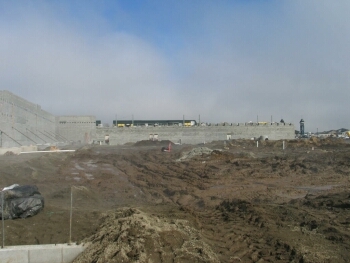 The overall fence length is 835 feet long. 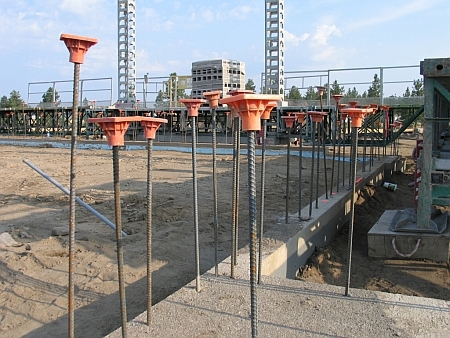 The system uses Post & Beam construction. 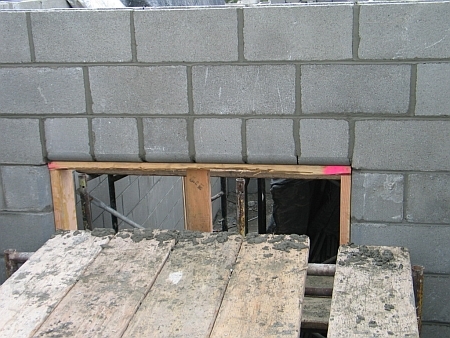 The panel block are stacked between the post blocks. 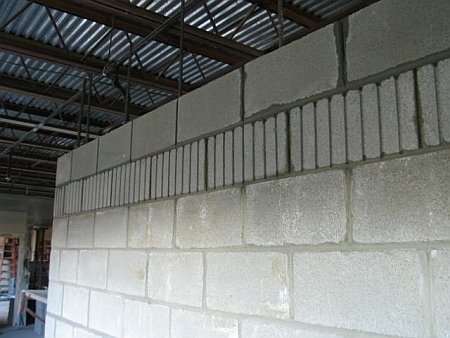 The first 2 courses are grouted solid with reinforcement, then the remaining panel block are stacked in place. Then the top 2 courses are grouted solid with reinforcment. This allows the panels to move with any frost heave that might occur during the winter. 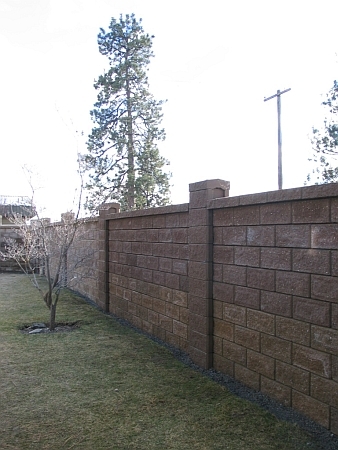 The Allan Block Fence is a great product for this application. 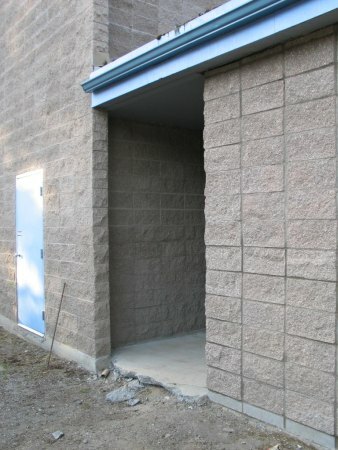 This building uses a double wythe wall system. 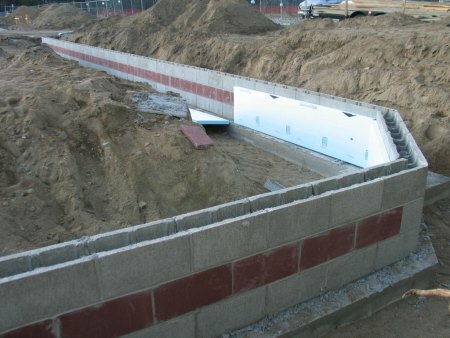 It has a 12" cmu structural wall which then has sheets of insulation applied to the outside. It is then sealed with asphalt emulsion and veneered with the 4" Splitface CMU. 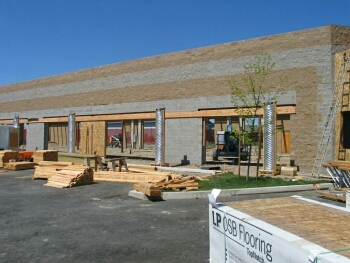 This project is using 8" Smooth for the main part of the building and 8" Splitface 7 grid as an accent band. 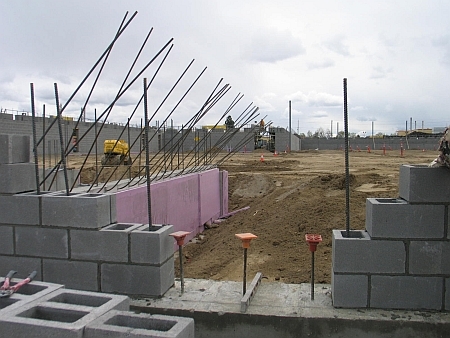 Before the portables could be relocated on the Ferris High School grounds, Dempsey Masonry needed to build the CMU foundation walls for the portables to rest on. This was a straight forward project on a limited time schedule. 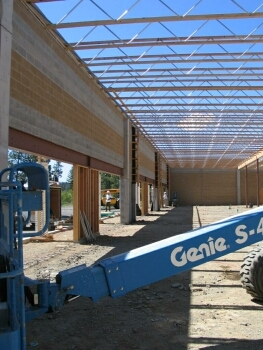 The buildings need to be ready for the new 2005-2006 school year. 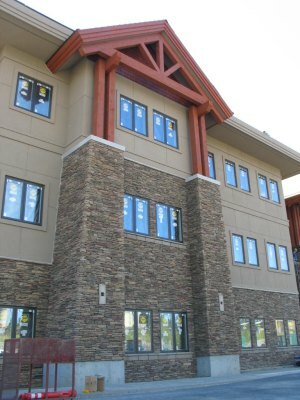 The Desert Tan Splitface block works well with the Natural Gray accents on this building. 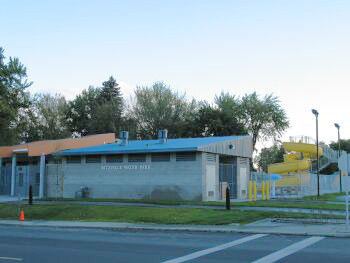 The steel culvert posts create a unique look to the storefront. 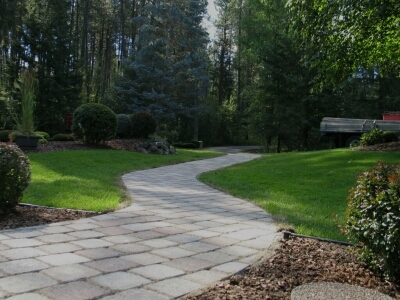 Our red pattern paver has been used for many years on the Gonzaga campus. They create a competatively priced, durable new walkway in front of Jepson Hall that ties in very well with the other pathways around the campus. This project was designed using 10" Splitface CMU - Shadow Color, 8" Splitface - Natural Gray Color, and 8" Splitface - Desert Tan Color. 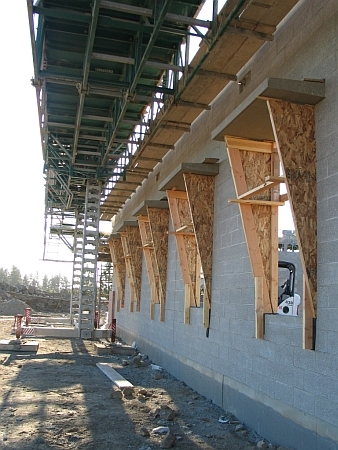 The 10" Splitface units were used on the lower part of the building. 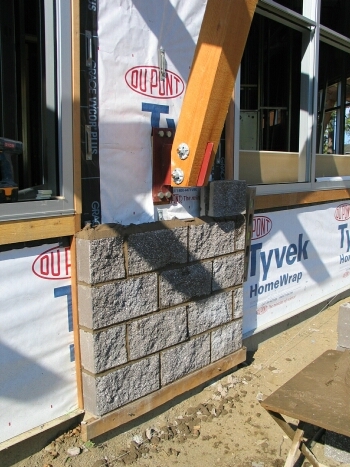 A 2" tall cap block was used as a sill block to transition to the 8" splitface block above the 10" block. 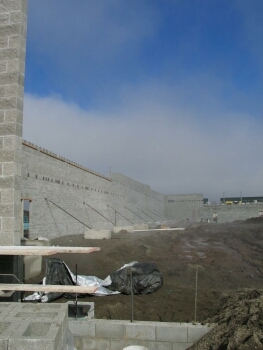 Spilker masonry landed a large masonry project in Airway Heights WA. 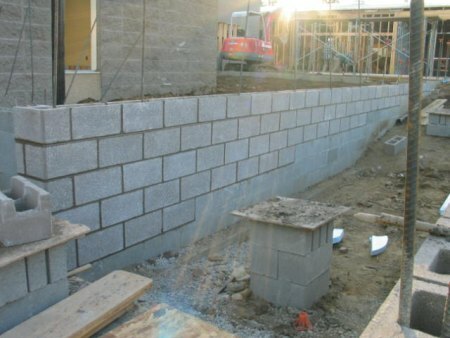 With over 30,000 8" Smooth and Splitface block to be layed and a short time to get it done, they chose to work with White Block, not only because we had a fair price, but because of the quality of our CMU. 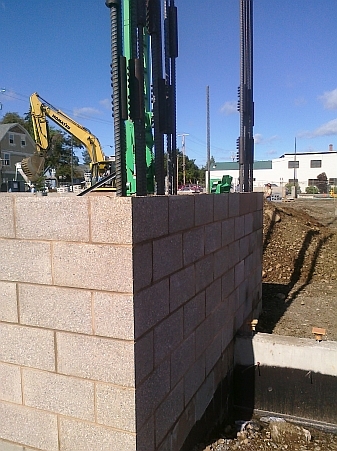 We were able to manufacture and deliver the block when needed to keep them on schedule. 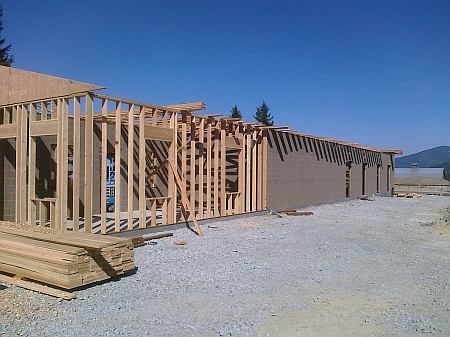 The owners wanted a durable long lasting building that will be used for a stable and birthing horses. The padre brown color has a nice earthy feel to it. 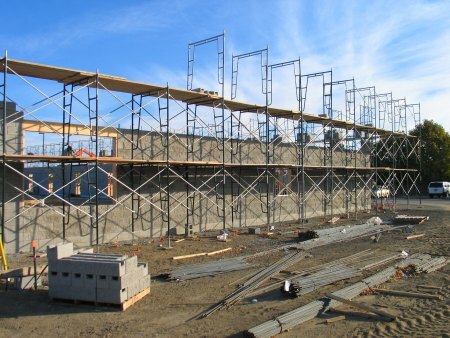 The Elevator Shaft and the two end stairwells needed to be completed before the framing for the building could be started. 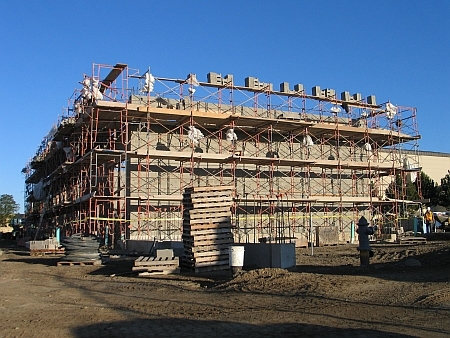 R & R Masonry built each 3 story section using 8x8x16 CMU in both a standard grey smooth block that will be painted at the interior elevations, and a 8x816 groundface Khaki colored cmu at the exterior elevations. 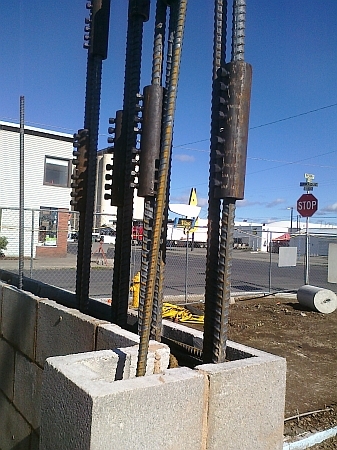 More pictures of the structural block & the required steel. This project used 3 different colors throughout the building. It uses Desert Tan, Sangria Taupe and Mesquite colors in both 8" and 4" Smooth CMU. The 8" and 4" Splitface CMU is our Desert Tan and Sangria Taupe colors. The Groundface 8" and 4" CMU is our Mesquite color. 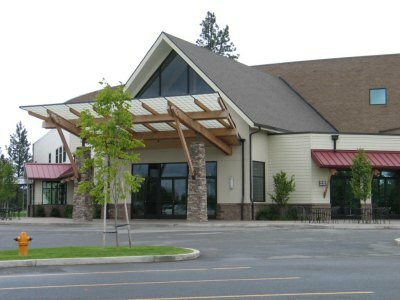 This building captures a very "earthen" look, that blends well with the surrounding landscape all year round. 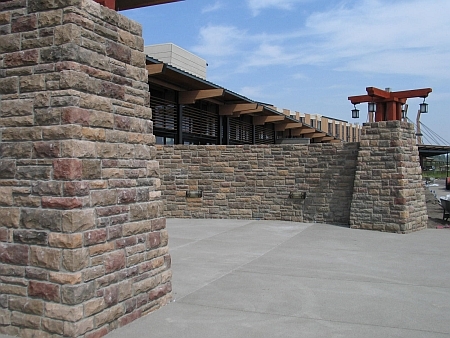 This project uses over 15,000 square feet of Cultured Stone. 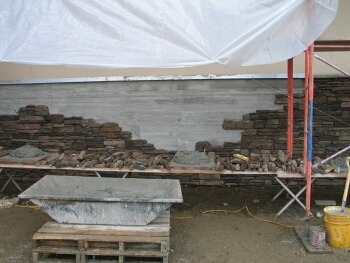 The majority of the project uses the Country Ledgestone Chardonnay. 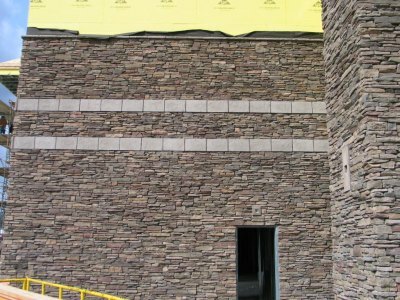 Other styles and colors used are the Country Ledgestone Caramel, the Weathered Edgestone Silverado and the Southern Ledgestone Chardonnay. 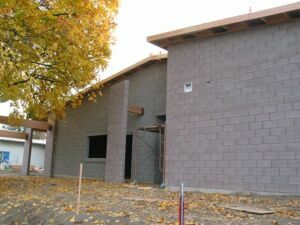 More pictures of the project as it nears completion of the exterior work. 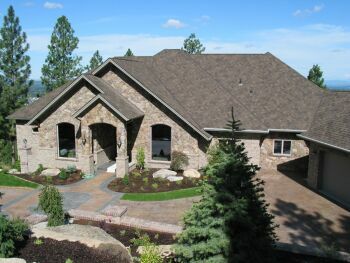 It uses the Cultured Stone Country Ledgestone in both the Caramel and Chardonnay colors. 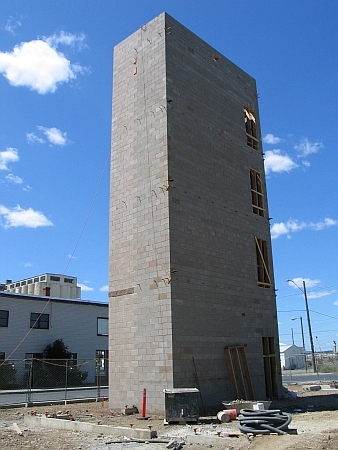 The design called out for a durable concrete masonry unit that could withstand fire for training purposes. The Smooth and Splitface cmu are made in the Normal Weight Density (heavy weight) which has a density greater than 125 pcf. 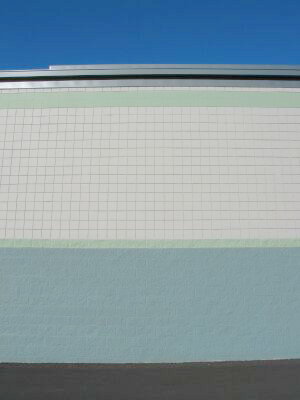 Our Midnite Shadow color was chosen as the bottom accent band for the building. Everthing above it is our Natural Grey. 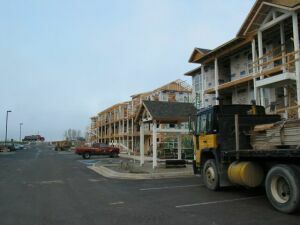 Great Northern's crew did a great job on installation while having to work in cold weather conditions. 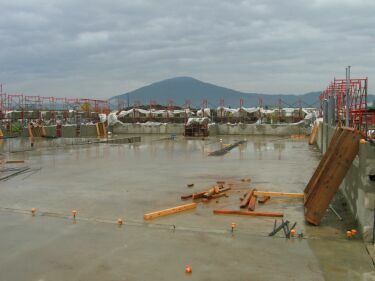 The concrete floor slabs had to be lifted into place by crane. The masons had keep to a tight schedule to be able to coordinate with the manufacture and installation of the floor decks. 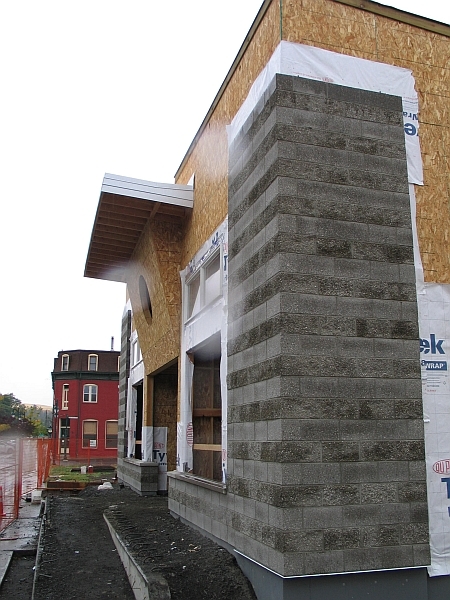 The architect wanted a heavyweight concrete block for this project. The design called for both smooth and splitface CMU. 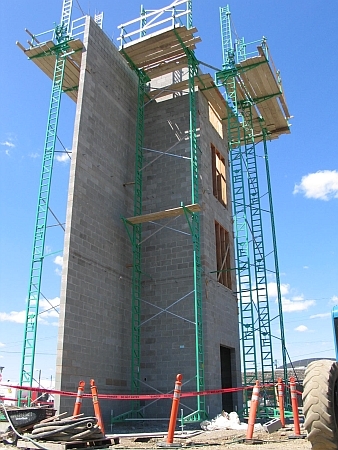 Eventually, the training tower will be 5 stories tall when completed. 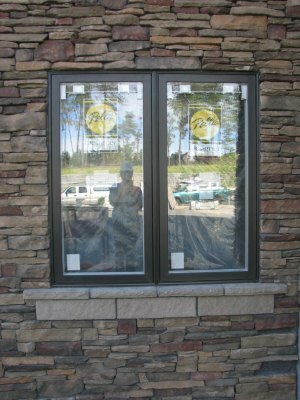 This project uses our 12" Splitface block in the Khaki color. 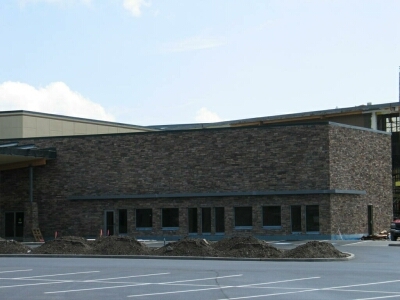 The new building will add great capcity for fellowship and worship for the congregation. 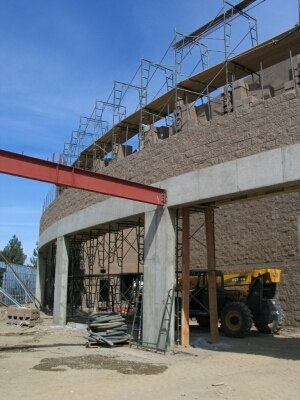 With its tall curved exterior walls, the new addition will offer a long lasting, durable, aestetically pleasing front entrance to the building. 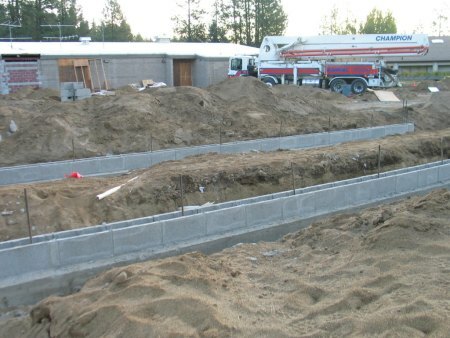 Footings for the remodel & additions at Lake Spokane Elementary have been laid, and it won't be long before the new Splitface and Groundface Integral Color walls start to go up. We had Davis Color do a color match to the existing CMU. We ran a sample for approval by Architects West. We did a little more color tweaking to get it as close as possible to the original colors on the building. 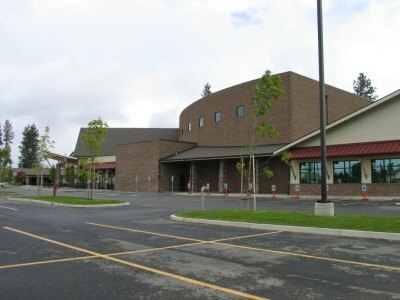 Once approved, we ran the block for both Lake Spokane and Nine Mile Elementary Schools. 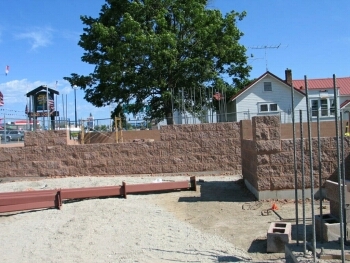 Now Anderson Masonry is building the new walls. This was a great project. 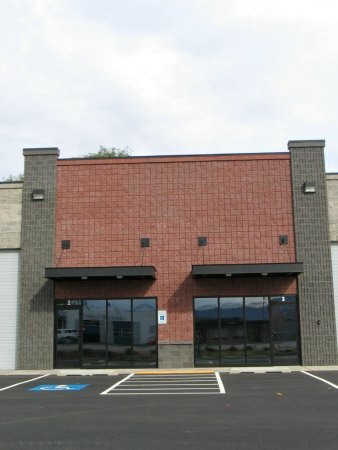 We manufactured 4 different colors of 4", 8" and 12" Splitface block, then remixed them on a pallet at the ratio the owner had specified for the building. 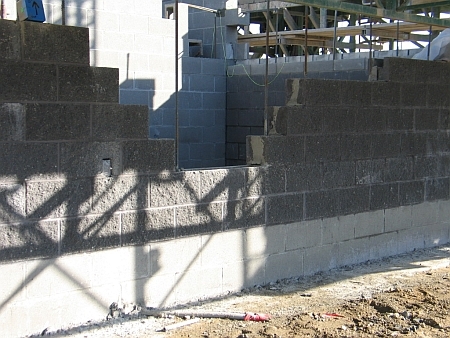 Because the block were preblended on the pallet, tha mason contractors did not have to keep track of the ratio and blend onsite which saved them considerable time. 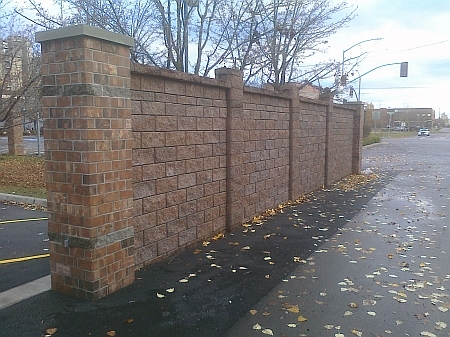 This was a fast track project and Spilker Masonry finished the job on time. 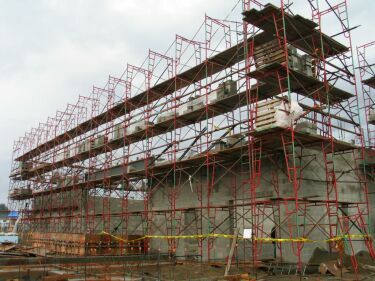 More contruction pictures of the Musselman project. 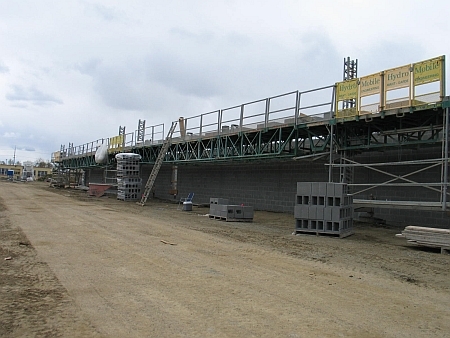 The use of integral color cmu is a great solution for projects like these. 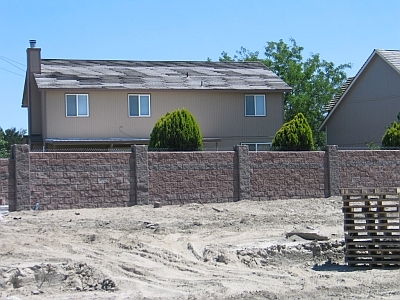 Using concrete masonry units creates a durable hard finish that will last an extremely long time. Using the integral colors, there is no repainting and it will require little to no maintenance. 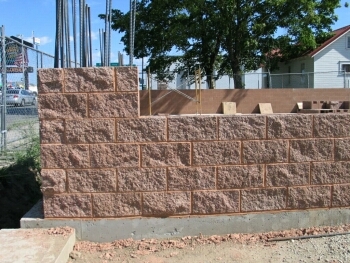 Spilker Masonry utilized 8" smooth and Splitface CMU for this project. 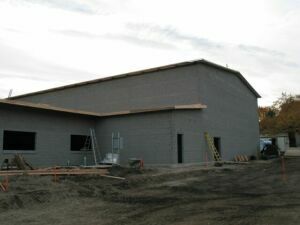 The cmu portion is finished and the contractor is roofing and insulating. 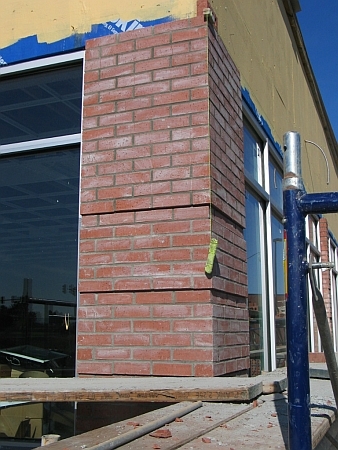 The red brick used on this project is the Acme Blend 150 Red Sunset out of the Denton Texas plant. 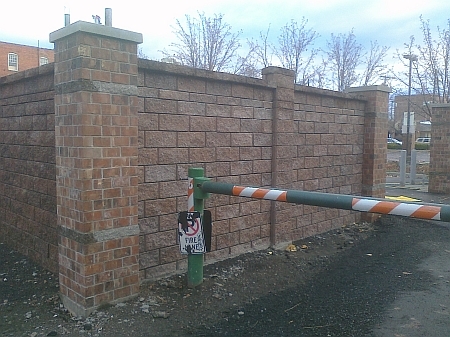 The brick is a national specification and is used on most newly constructed Chase Banks. 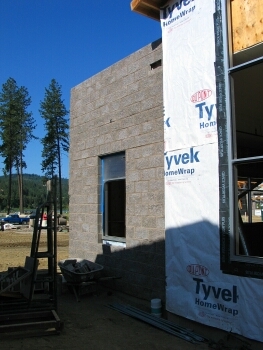 The product selected for the new hotel is the Cultured Stone Pro-Fit in the Shale color. 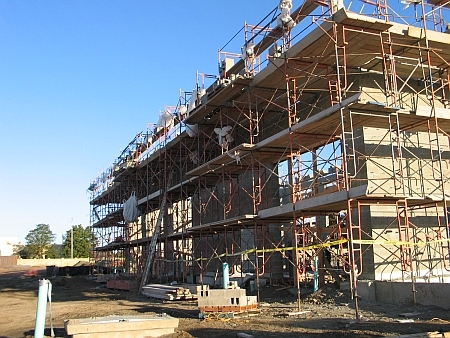 With multiple buildings under construction, scheduling is the key to keeping the owners happy. 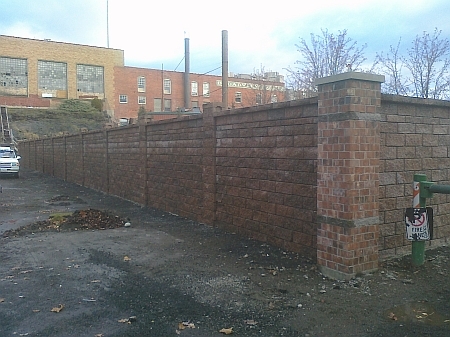 That is what the crew from R & R Masonry has done. 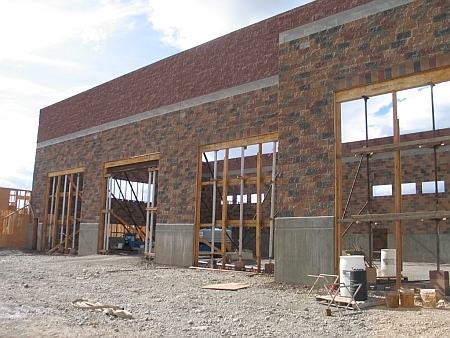 As each building is framed and then sided, they follow with the cultured stone veneer on the front of each building. 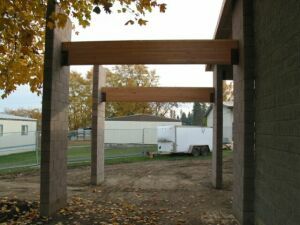 They also constructed piers and columns that surround the complex and the parking garages. 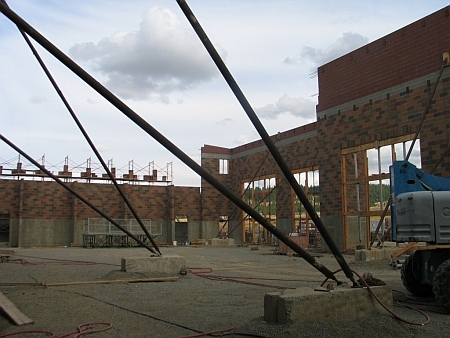 This project will use over 4000 square feet of Southern Ledgestone Flats and 700 lineal feet of corners. Joining the Military Requires at least two trips to the Military Entrance Processing Station. At minimum, you make a trip to MEPS for initial processing and then a second trip to MEPS for your final processing on the day you ship out to basic training. MEPS is a Department of Defense joint-service organization staffed with civilians and military personnel. Their job is to determine the applicant's aptitude, physical qualifications and moral standards as set by each branch of military service, the Department of Defense, and federal law. The design team at WAG wanted a building that, when looked at from a distance looked monochrome. But as you got closer, features of the materials used would pop out. For this reason they used a standard gray color CMU, but utilized the the groundface texture to expose the aggregate of the block. 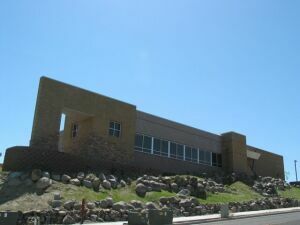 They created clean looking horizontal lines with the precast details over the windows and doors. 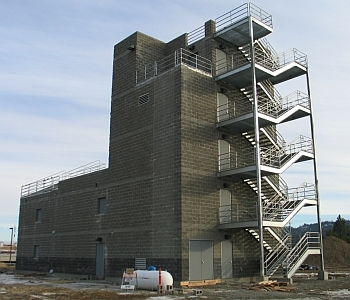 This project called out in the specifications a Lightweight CMU mix design. To achieve the specified weight limitations and compressive strength, we had to utilize expanded shale as our lightweight aggregate. Normally we use pumice from south central Oregon as our lightweight aggregate. 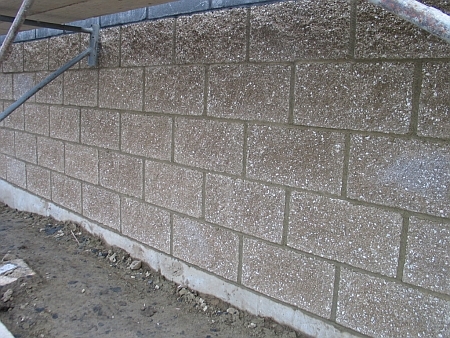 While pumice is more cost effective, it is softer and not as strong as the shale. We brought in the shale from Utelite Corp from the Salt Lake City, Utah area. They were very helpful in helping us with the mix design to meet the required specification. Overall this has been a great project for us and the mason contractor. The 12x8x16 blocks had to weigh no more than 42# for a smooth standard. The shale block weigh in at 39#. Our "normal" mix design they would weigh in at 48#. 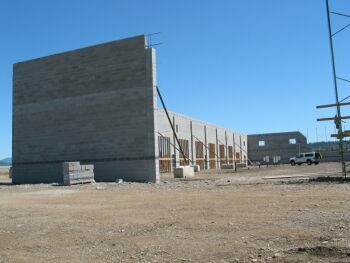 The masons like the lighter block, but the cost of the shale cmu tends to be more than most projects have in their budgets. 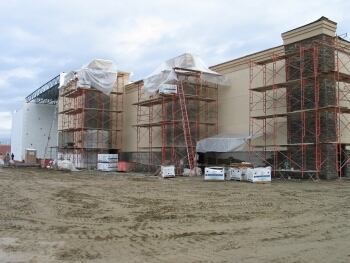 More construction photos of the New Northside Lowes project. This project utilizes a 4" splitface cmu with a groundface sill unit that creates an excellent transition into a red brick veneer above the cmu. 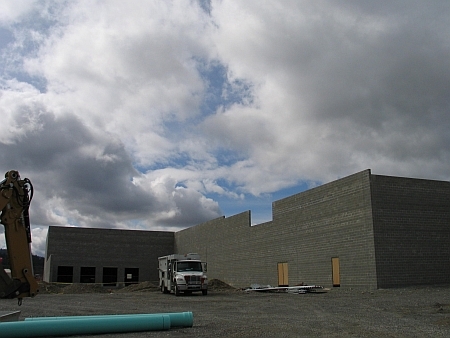 The body of the new office building is our Splitface Desert Tan. 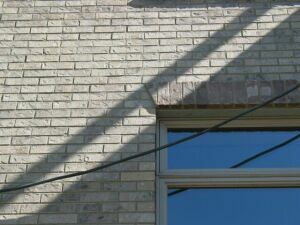 The quoin corner effect is achieved by using a natural gray splitface block. 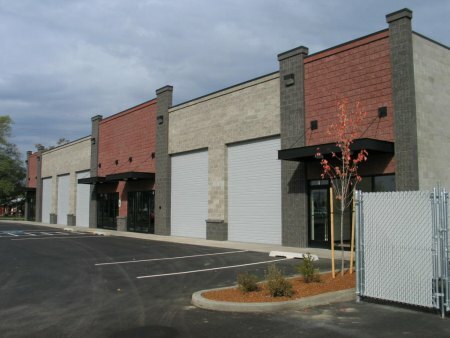 The block strength specification for this project was 2800psi. This is above the standard spec of 1900psi. The other stipulation was that 12% of the total aggregate used in the production of the CMU had to be recycled material. 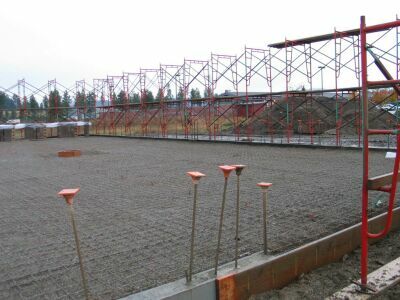 We were able to utilize material we had crushed and graded from our facility for the recycled content. 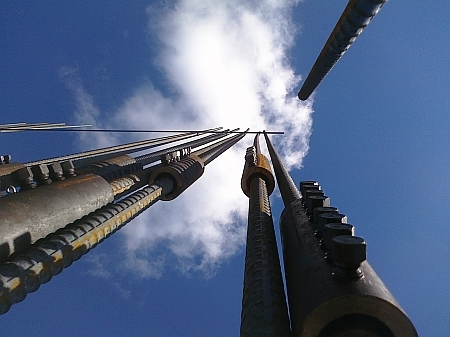 When we tested the blocks compression strength, we achieved a strength exceeding 3000psi at 14 days. 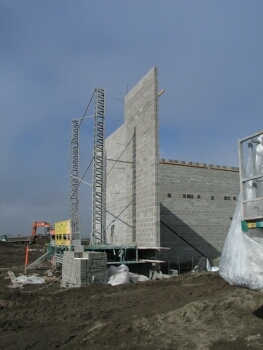 Great Northern Masonry started the project in January of this year. 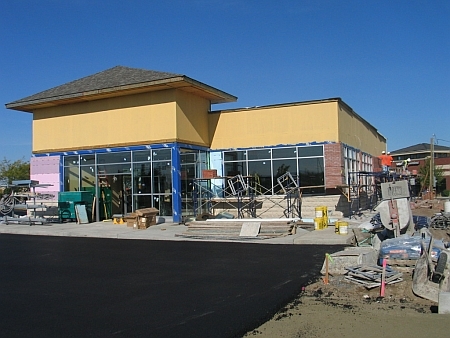 The majority of the work was completed by mid April. 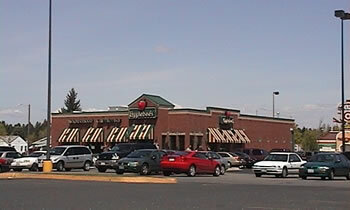 The project had a couple of phases that required Great Northern to leave and come back a few times. They finalized their part of the project in mid June. 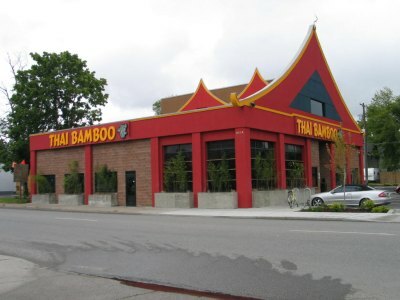 The Tangerine Splitface block create an inviting new building for the owners of this restaurant. 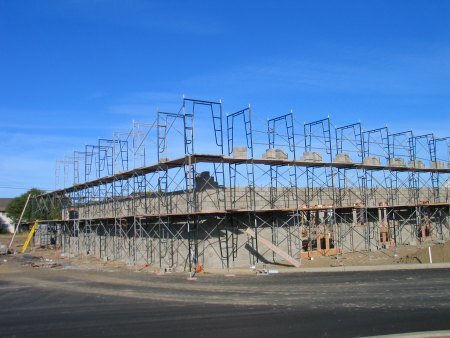 The unique design to fit the building on the lot will add a lot of character to the overall appearence once the building is completed. 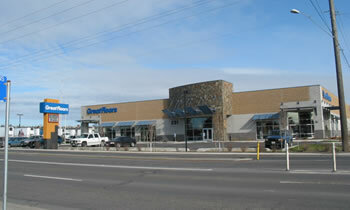 New Walmart Super Store in Airway Heights. The project uses a variety of CMU types for the structure of the building. 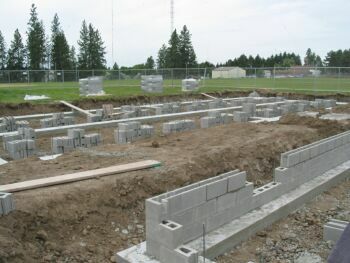 Footings for the remodel & additions at Nine Mile Falls Elementary have been laid, and the new Splitface and Groundface Integral Color walls are going up. 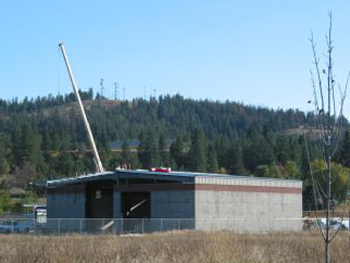 Once approved, we ran the block for both Nine Mile Falls and Lake Spokane Elementary Schools. 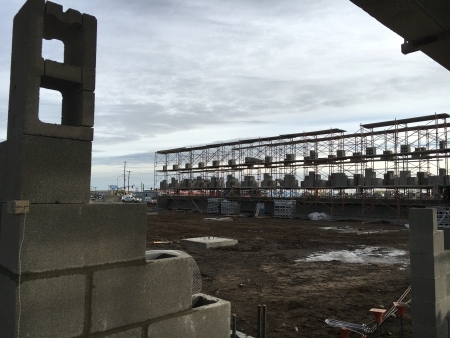 Being the smaller of the two projects and having a tighter time frame, the majority of the CMU has been delivered and Anderson Masonry is laying the block as fast as they can. 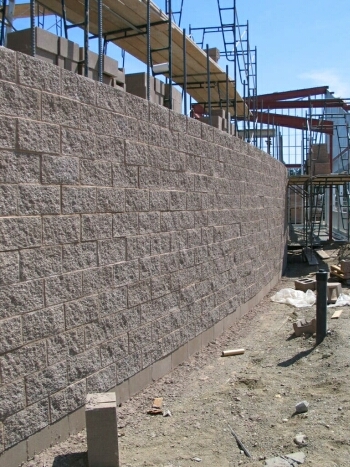 Northwest Masonry landed this job with Citidel Construction after helping them on a prvious project with a tight deadline. 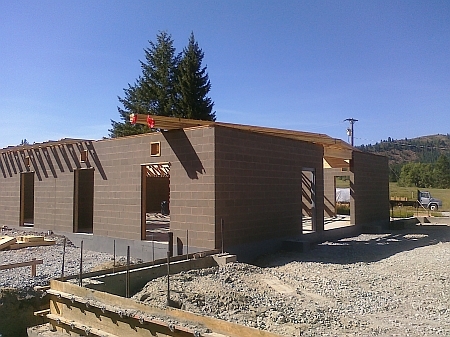 The basic shell of the building needs to be up before the interior work of thei project can begin. 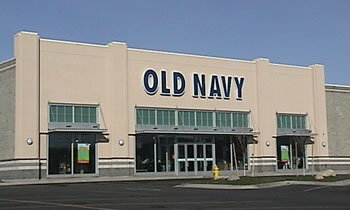 Old Navy, TJ Max and Linens & Things were built simultaneously by Vandervert Construction and Spilker Masonry. Old Navy and Linens & Things were built using 8" Single Grid Smooth and Splitface - Charcoal color, 8" Groundface - Glacier color, 8" Splitface Single Grid - Mesquite color and 8" Smooth and Splitface in Natural Gray color. 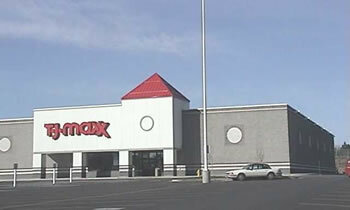 TJ Max was built using 8" and 12" CMU. 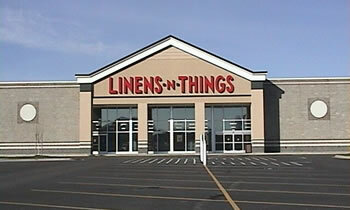 It uses the same styles and colors as Old Navy and Linens & Things. 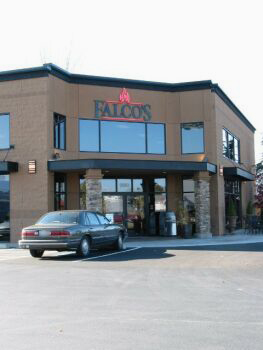 This project used a 4" Veneer 3 Grid Splitface CMU in Natural Gray. We had to match the existing building's CMU for style and color. This can be difficult even in a Natural Gray product. 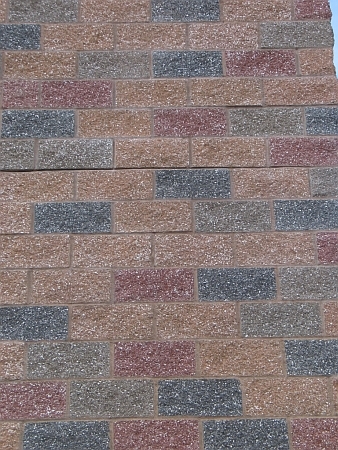 Aggregates and cements can change color, especially when there is a number of years between the original building and the addition. 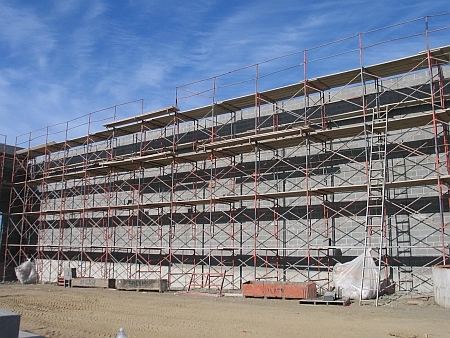 Overall, we were able to produce a very good match for the mason contractor. 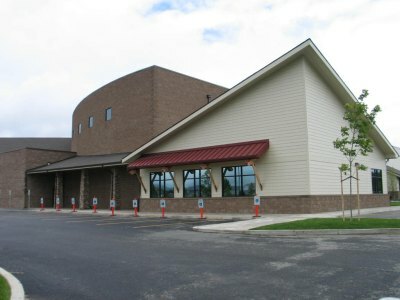 The new Palouse Community Center uses just a little bit of accent masonry. 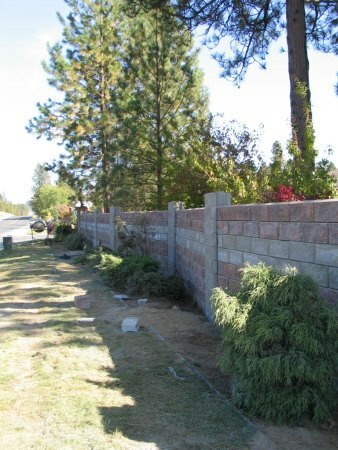 The homeowners association needed to replace an existing wooden fence that was in direpair. 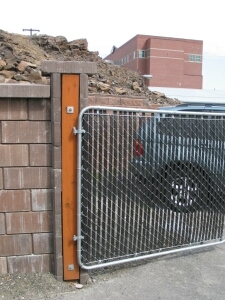 The looked to the AB Fence System to give them the durability and low cost maintenence that they needed. 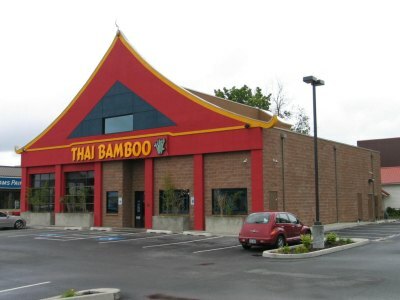 This was a challenging addition to the existing building. There were 5 different block sizes, 2 custom shapes and 3 different colors. It also included 3 textures on the faces of the blocks. There were Splitface, Groundface and Smooth. Coordinating the product shipments with the mason was challenging. 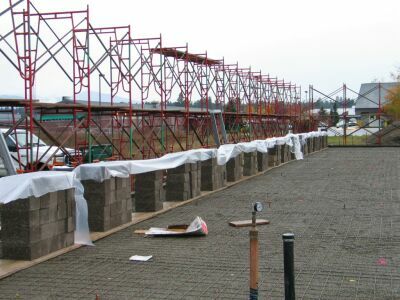 Each pallet with the different size, shape, color & texture needed to be marked to keep the material organized onsite. 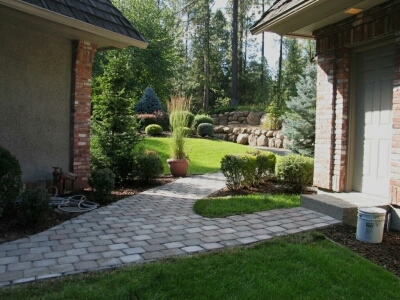 Melvin from Elite utilized the Willamette Graystone Appian Pavers in the Classic color to create an extended patio from the back of the house. 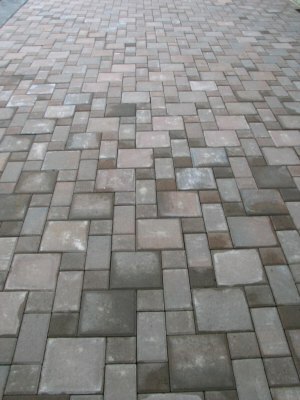 The project uses three sizes of pavers to create the pattern. 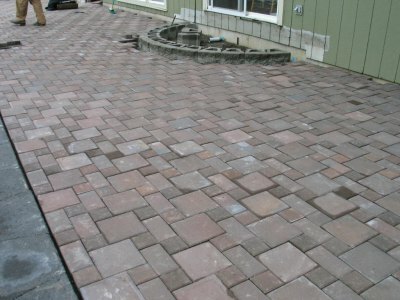 Here the contractor uses a 50/50 mix of our Palermo Patio Stone in the Antique Blend and the Shadow Blend. The Homeowner wanted a more unique look to his home in the woods. 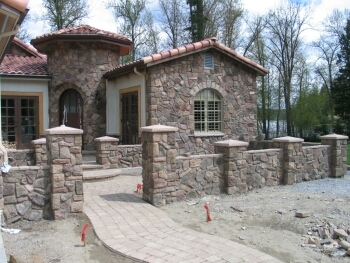 The masons used Cultured Stone's Dressed Fieldstone - Bucks County as the main body of the house. 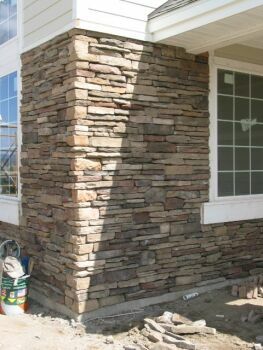 They also used Cultured Stone's Old Used Brick Veneer to give the illusion that the stone is falling off the structural brick of the house. 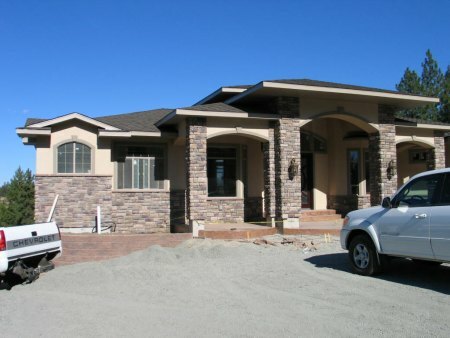 The Old Country Fieldstone is a great look for this spanish style home. The Chardonnay color picks up a lot of the earthy colors that surround the home. Using the stone at the entrance and in the courtyard makes this house stand out. The product used on this house is the Limestone Chardonnay. 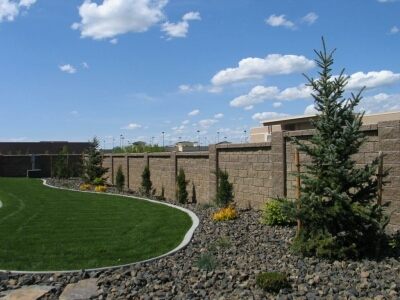 The owners chose the product to compliment the surrounding natural landscape as well as the retaining wall products used onsite. 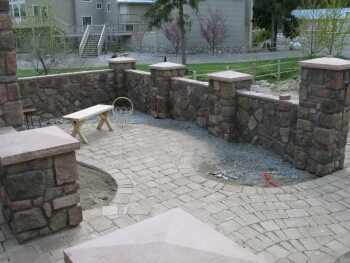 The customer was looking for a secure, durable product that they could use to enclose their back yard. 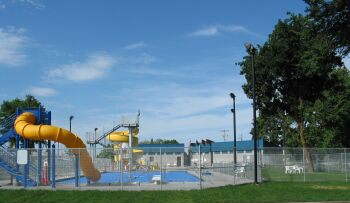 The AB Fence used in this project is fully engineerable, and has been used as fencing, sound barriers, bin enclosures and many other designs. 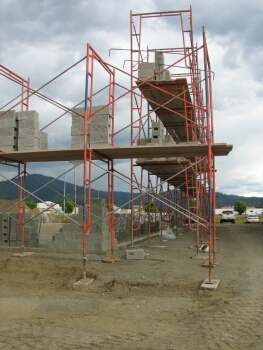 It is based on a post & beam construction and does not require a continuos footing, which can be costly. 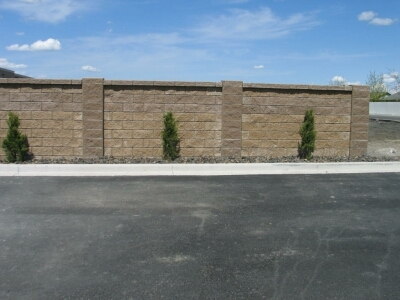 Elite Hardscaping did a great job on the installation using our Khaki and Desert Tan colors to construct the fence. 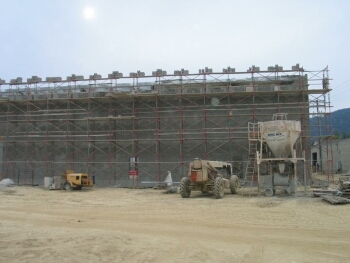 This project has Groundface and 7 Grid Splitface CMU. 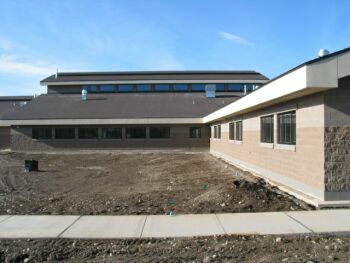 The 7 grid Splitface was to match to the existing building and the integral color Groundface CMU defines the entrance to the addition. The design called out for chamfered corners at the groundface block. 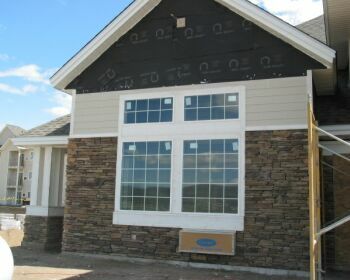 Dempsey Masonry had to schedule this project in two phases. 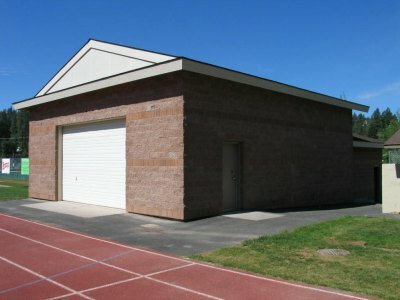 He built the Shell of the Gym area and part of the interior walls, then came back a few months later to finish the exterior and interior walls. R & R RV is expanding their RV Service Department and Anderson's Masonry Construction is building the new service center with our 8x8x16 Splitface CMU. 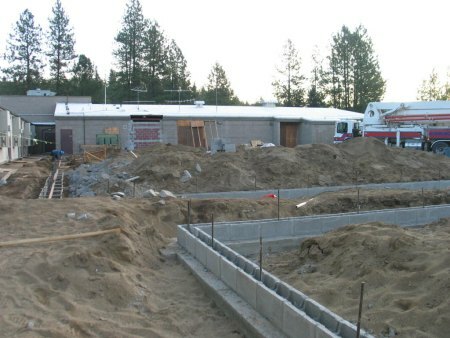 Work is well underway at Ramsey Elementary School in Coeur D'Alene, Id. With the school's increasing student population and the need for building updates, this project has been in the works for quite a while. 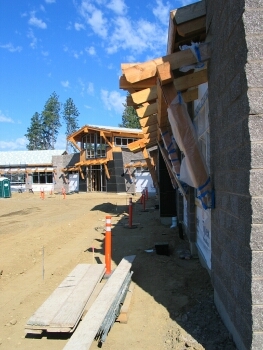 The funds for the remodel were part of a School Plants and Facilities levy passed in 2000. 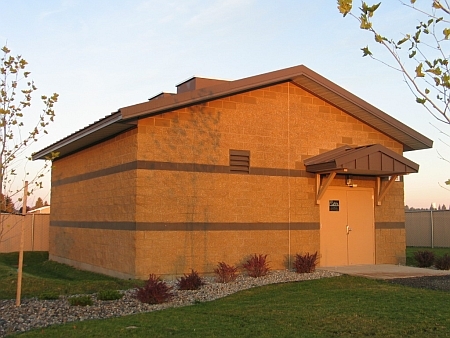 The plans were put on hold because the remodel of Lakes Middle School held a higher priority. 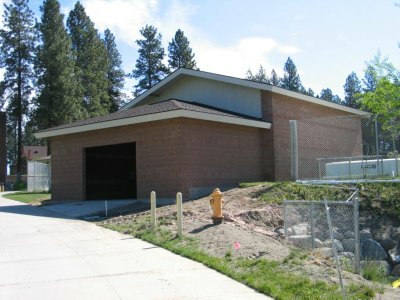 When it was learned that the Lakes project would exceed the available funds, the Ramsey remodel project was restored. 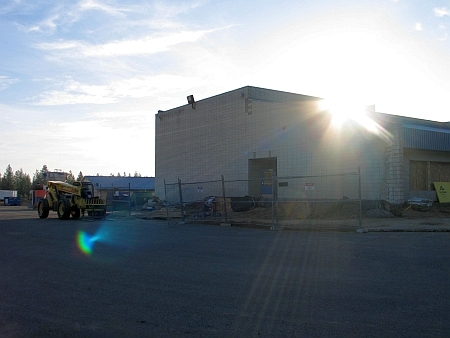 Ramsey Elementary will get ten additional classrooms and the portables will be removed. Existing classrooms will be upgraded with built in shelving and coat closets. The new Gym adds a great space for athletics and assemblies for the school as the existing gym doubles as the schools lunch room. To keep this project within budget, it was designed using 8" Smooth, Smooth Single Grid and Splitface CMU. 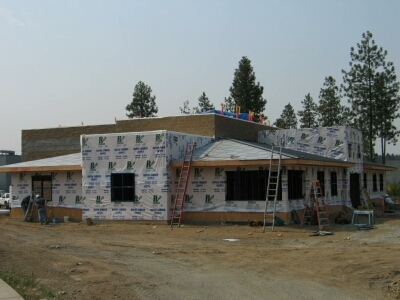 Using the Splitface and Smooth Single Grid units as accents in the wall give the building character. For this project we ran a new color in our 4" splitface block. It is called Black Walnut. It is a richer dark brown/black color. The overall effect of the block creates a nice offset color to the stained timbers used in the building. 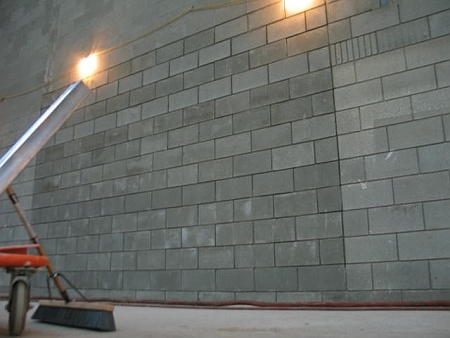 Concrete Masonry have long been used for car wash buildings throughout the U.S. 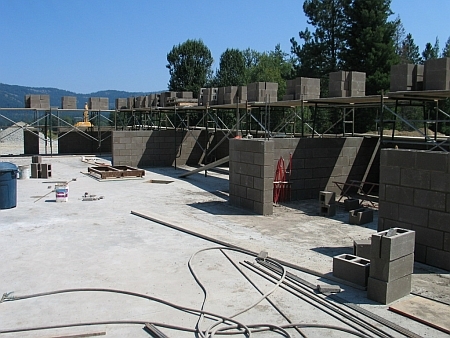 Concrete Block were chosen for their strength and durability. 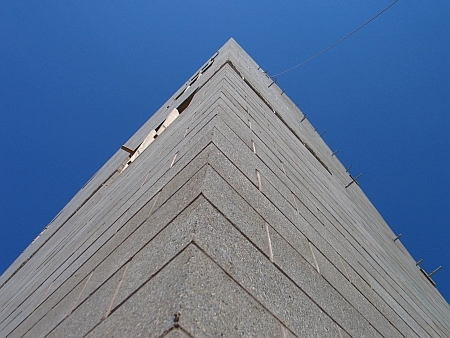 The buildings use both smooth and splitface block. The next time you need to wash your car - take the dog and go to the Ruff N' Fluff Dog Wash! 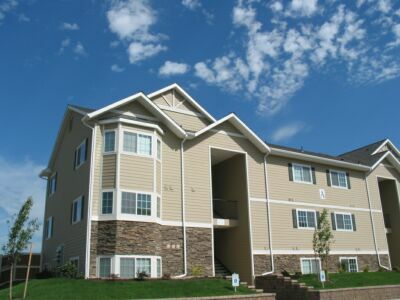 This project used 8" Splitface - Khaki color for the main body of the building. 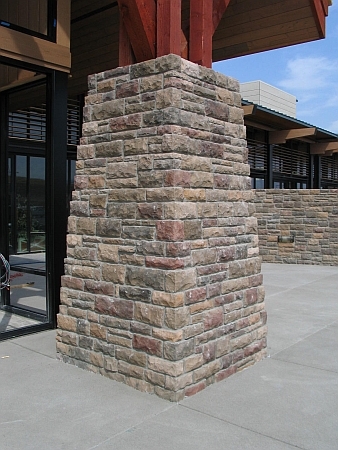 Accent block include Groundface - Brick Red color and Khaki Color at the columns and entrance area. 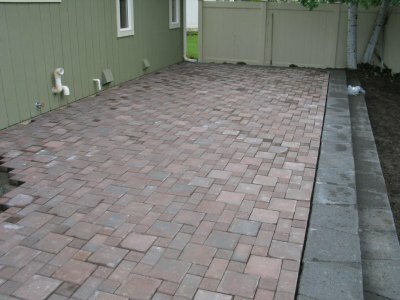 An 8" and 4" smooth block in our Kahlua color was also used as an accent color. 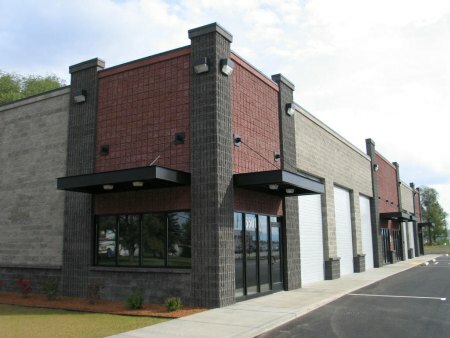 8" CMU was used for the addition to Sandpoint Furniture. 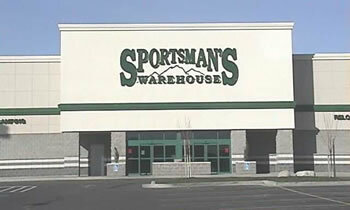 This building was the first of 4 to be built in this phase at the Spokane Valley Mall site. It uses our Splitface block in the Mesquite color as well as our Glacier Groundface block as an accent band. 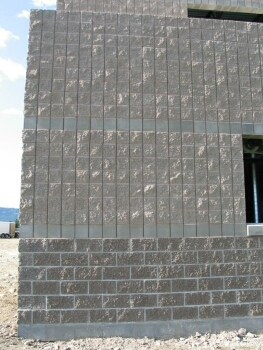 Natural Gray color in both Smooth and Splitface textures were also used in this project. 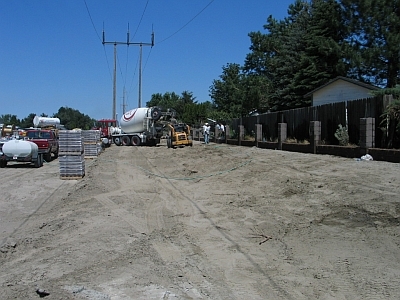 The City of Kennewick took the lead in design the street extention project. 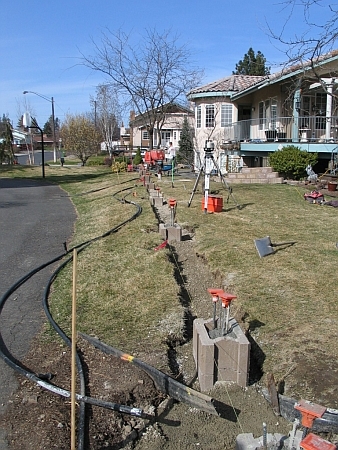 The extention runs down the dividing line for the City of Kennewick and the City of Richland. 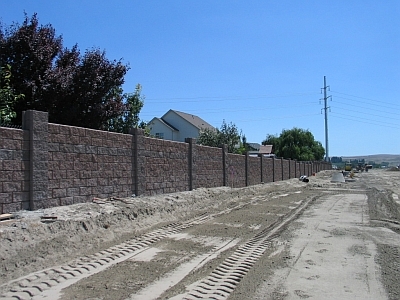 The design engineer for the City of Kennewick had included the AB Fence System as one of the options for the fence / sound wall. 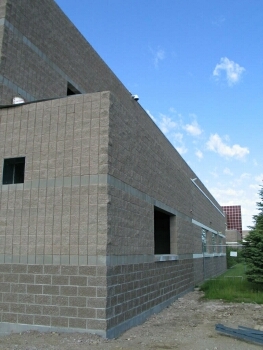 The Tri-Citites area has used masonry and concrete for soundwalls on previous projects so a masonry type product was familiar to them. 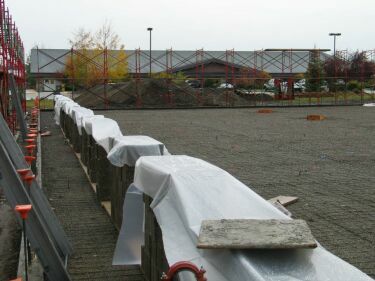 The AB Fence System was to be used to replace the existing wooden fences that ran parallel to the new street extention. 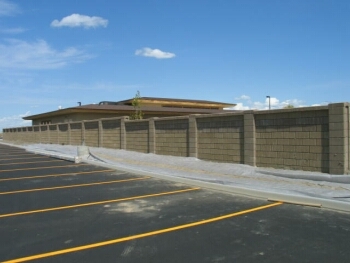 The reasons for using the AB Fence System were the durability, it requires less maintenance, offers security and sound abatement and was a cost effective material to use. 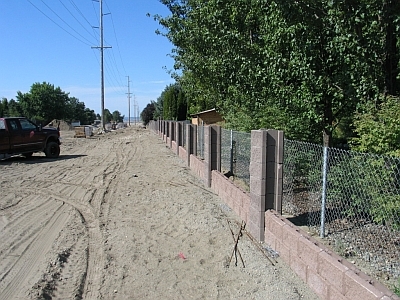 Segmental Systems installed the fence wall over the course of about 2-1/2 months, keeping the project on schedule and on budget. 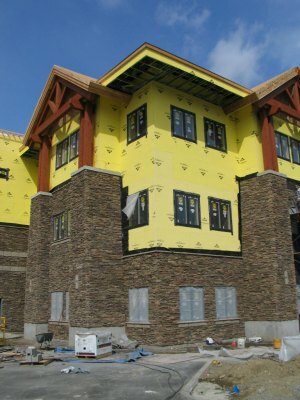 This project uses our Tangerine color Splitface CMU to go with the overall design of the building. 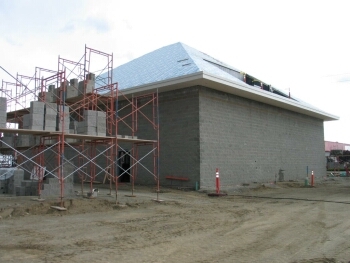 R & R Masonry built the shell of the building and the other trades followed up behind them resulting in a well built, on time, on budget project. 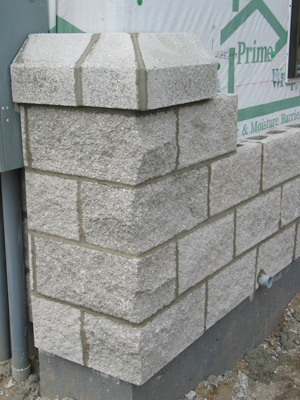 Pro Masonry chose White Block Company to supply the block on this product for our quality products and competitive prices. 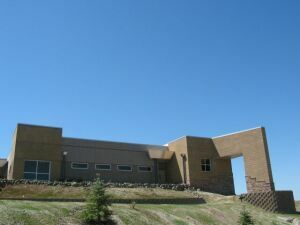 The building uses a mix of both smooth and splitface CMU. 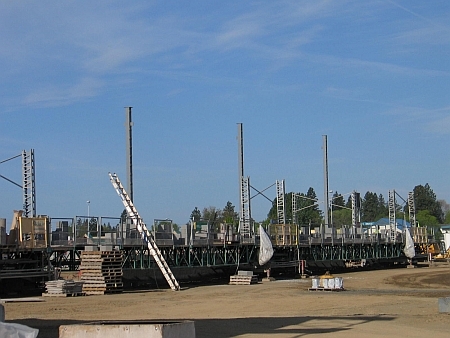 This project started construction in late May. 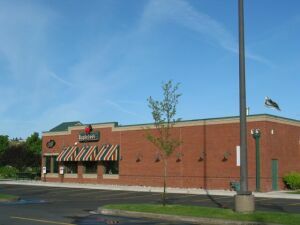 It was designed using 8" Splitface and Groundface Khaki colored CMU in the main section of the building. 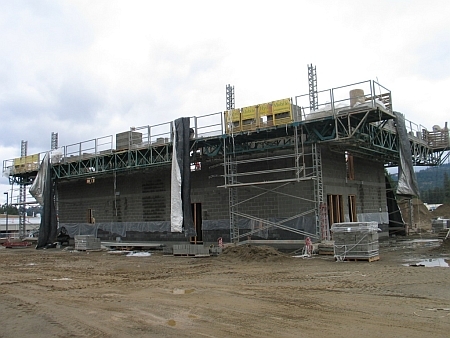 The 12" CMU will be used to construct the new gym. It will also use the Khaki color in both Splitface and Groundface block. 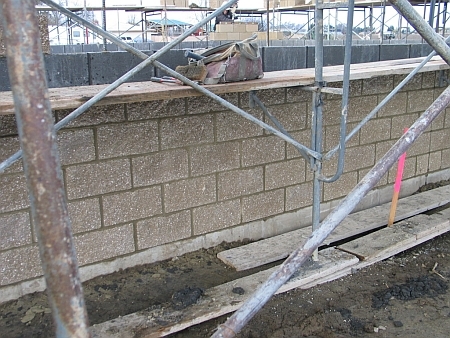 Spilker Masonry has made a lot of progress on this project since they first started. 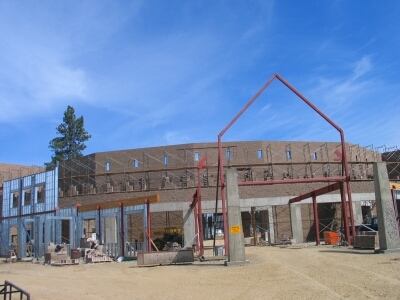 The main shell of the building is up and the school has taken form. 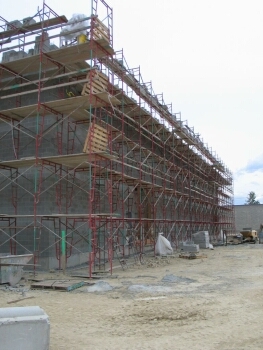 Spilker Masonry expects to be finished with their phase of the project within the next few weeks. What a great project! 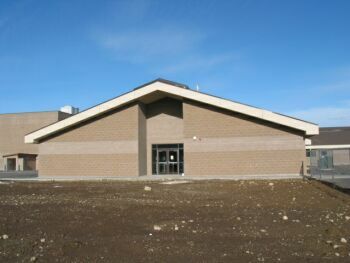 The school is nearing completion. 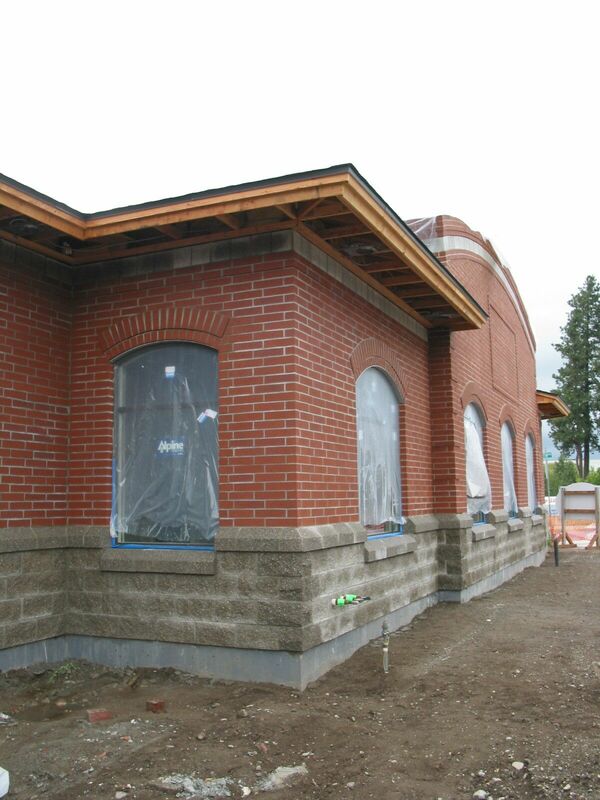 The Masonry work has long been done, and the fixtures and finish work is almost done. On my last visit, they were busy getting the computer system in and cleaning the areas that will soon be ready for students. 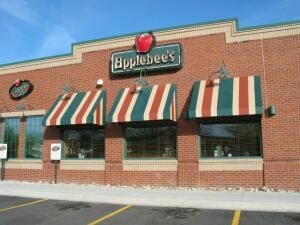 The owners of the property took great care in choosing the "right" colors for the new building. They used a modified version of our Midnite Shadow and our Coug Crimson color. 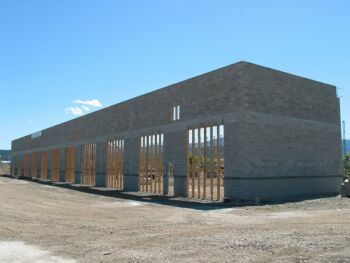 With the Splitface and Splitface blocks with grids, a simple design for a an office / warehouse building looks great. 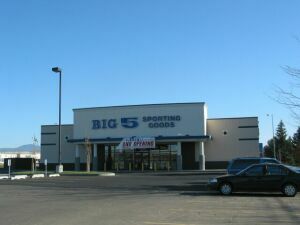 It is a building that they can be proud of for a long time. 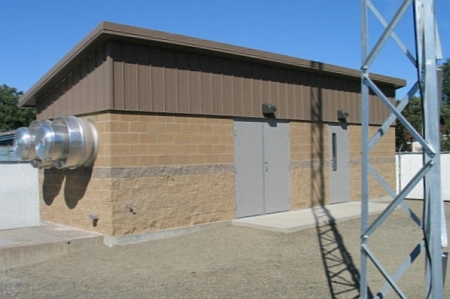 The main shell of the building is built out of 12x8x16 Splitface and Smooth Standard CMU. 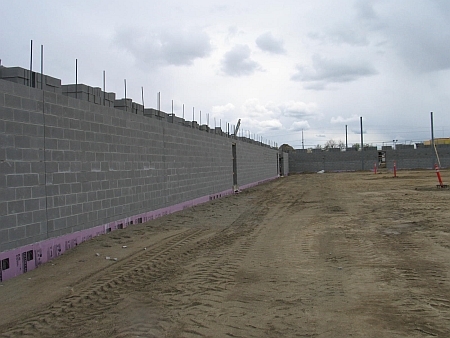 Because of the wall heights and many openings, they needed a larger CMU to accommodate the extra rebar for reinforcing the walls. 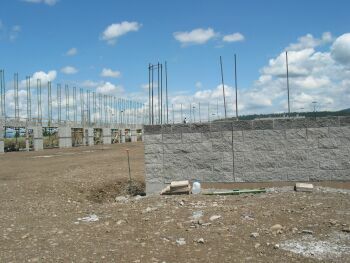 Many of the interior walls will be 8x8x16 CMU. 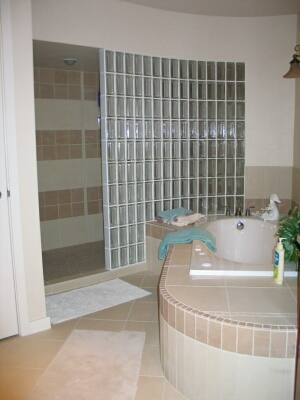 Here a pictures of a 2 walk in showers. 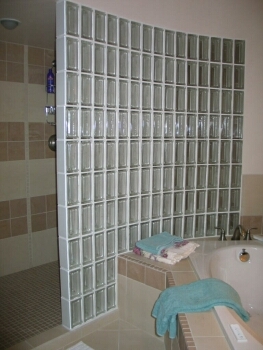 The 1st uses the 4x8 Premiere Decora Glass Block. 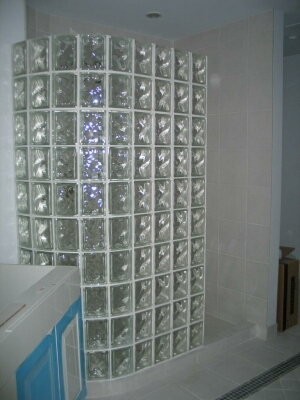 The 2nd uses the 4x8 Premiere Vue Glass Block. 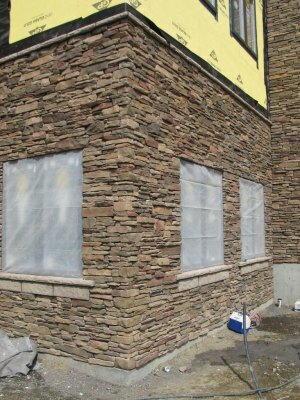 The Cultured Stone Southern Ledgestone Chardonnay was a great choice for this project. 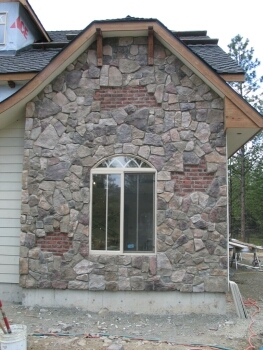 While the stone is a little more difficult to install, it creates a beautiful look for the building. The stone has a very natural look and is difficult to tell that it is man made. 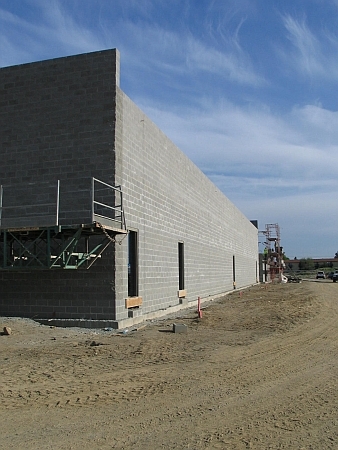 After the collapse of the existing bus garage due to the heavy snow loads during the winter of 2008/2009, the school district is replacing it with a new CMU Structure with abrick veneer. 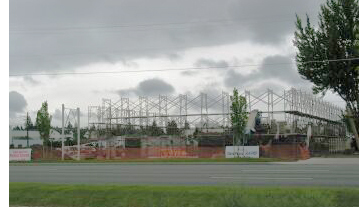 The remains of the old building were removed, and the new building is being built at the same location. 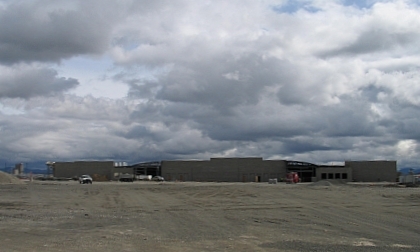 When completed the new facility will be able to house the district's buses and provide an area for maintenance of the vehicles. 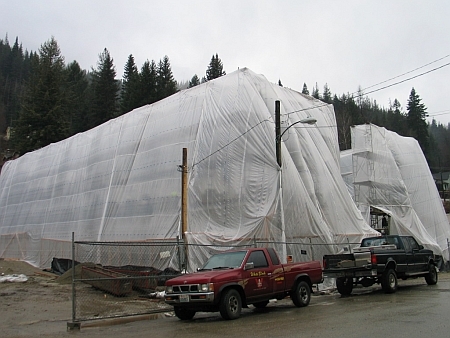 The building is covered with visqueen and heated to prevent the mortar & grout from freezing during construction. 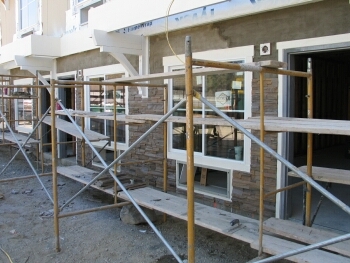 The last picture shows a masonry "buck" being used to create the opening for the window while the block are being laid up. 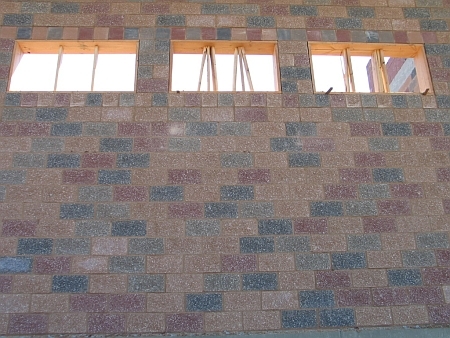 A "lintel" or "bond beam" course will be laid across the top of the window opening and grouted solid with rebar to create the window opening. 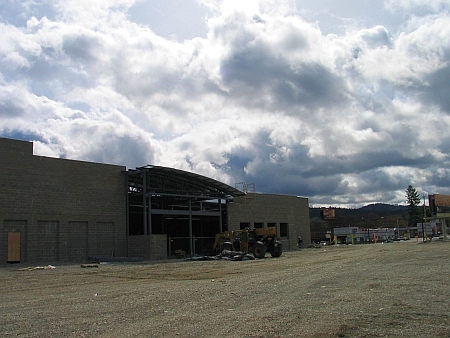 This Walmart Super Center utilized over 50,000 8" splitface and smooth cmu. 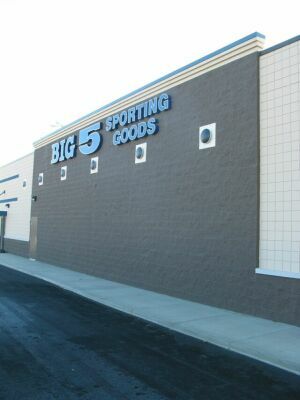 This store also utilized some of our Owens Corning Cultured Stone for a veneer out front. 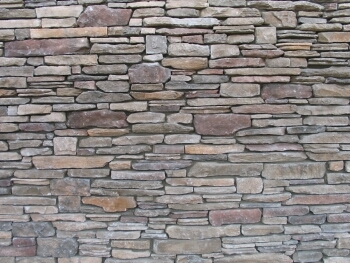 The style & color of the stone is Country Ledgestone Chardonnay. Cultured Stone as supplied by White Block Company, Inc.
Cultured Stone's Southern Ledgestone Chardonnay was the product of choice for this project. 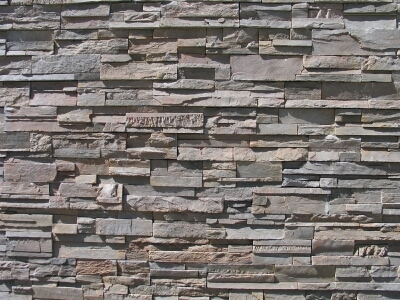 With the quality look of real stone at a lesser cost, the Southern Ledgestone fit the bill. 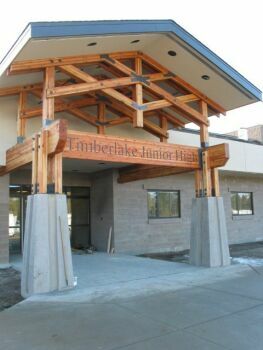 Johns' crew worked on this project, paying close attention to details. They had to contend with many inside corners on this building. The only way to do them is to weavve them together as the stone is laid. 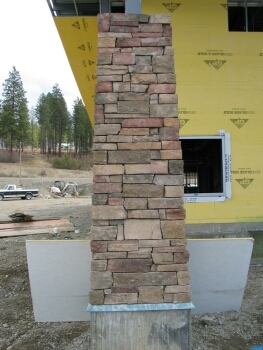 The use of the Cultured Stone's Tuscan Lintel created great accent bands on this very tall building. 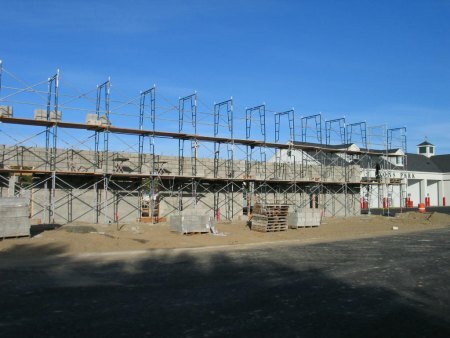 More pictures of the Wandermere Professional Building. 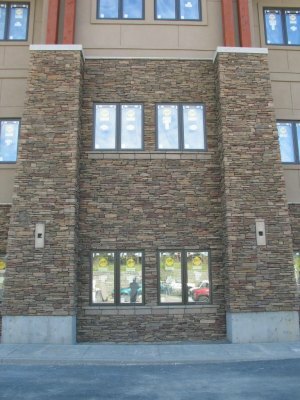 Southern Ledgestone Chardonnay was used throughout the project. 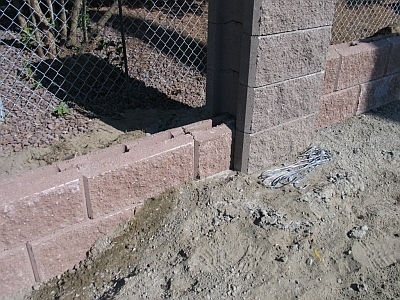 This remodel is using a variety of smooth cmu block. There are 12", 8", 6" and 4" cmu in the remodel. We also had to match the existing 7 grid smooth in gym area. 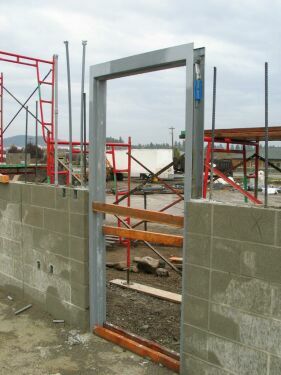 The 1st few phases are doing infills in walls where doors/windows have been taken out. They are also changing the layout in the shop/compressor rooms. Overall there will be over 10,000 blocks installed. Color selection was very important in the design of this project. 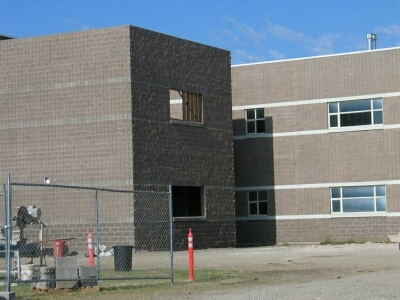 They needed a red color brick that had enough variation in it to match some of the older buildings on campus. 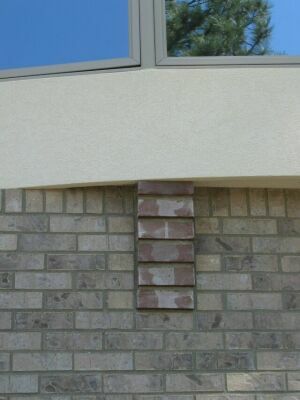 The Acme Brick - Harvard Color fulfilled those needs. We had to match the existing colors on campus to supply the product for this job. 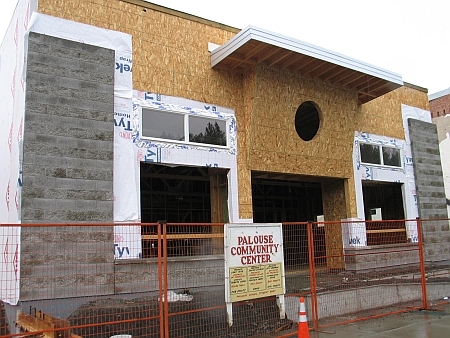 Our Tangerine Splitface block blends well with the existing buildings.